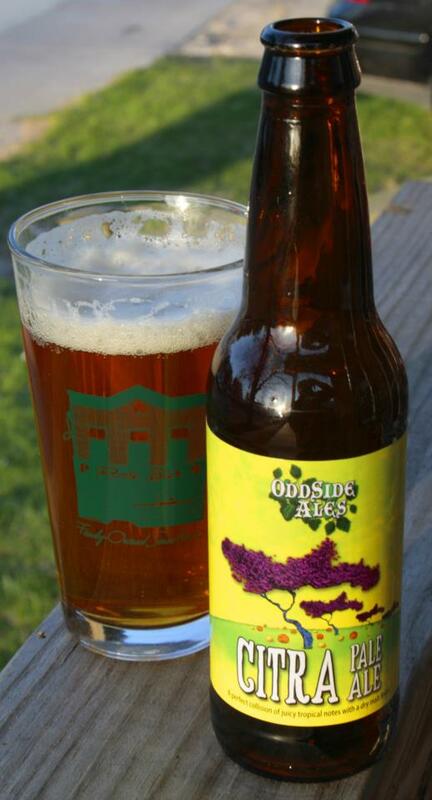 Out of Grand Haven, Odd Side Ales is another of those Michigan breweries that has had those lucky enough to try their beers singing all kinds of praises. Like all raves of beers from the Mitten State-Yes, there is a bit of bravado and Michigan pride going but, like all Michigan beers that get such hype, what's in the bottle backs it up. Pours hazy golden in color. A one finger head is fizzy, melts moderately and leaves a snow drift looking haze behind. The scent smells like a tropical fruit salad. Very crisp & bright and booming with grapefruit, pineapple and mango. Those scents carries through in the flavor as tangy orange peels, drops of lemon and pineapple juice come out all over the citra hops on top of the first few sips. "Quite juicy" is the simplest way I can put it actually as far as a first impression goes. A lighter malt provides a background of cheesecake crust and honey that accent the citrus top end quite well. The ending is slightly oily so it hangs around for a little bit but also keeps it from being super-sticky and giving the sides of the mouth and back of the throat the impression that it has been chewing on grapefruit peels for the last hour. The very end is clean giving the beer a sessionable quality and allowing it to go well with a backyard barbeque or something to hit the spot after mowing the lawn. Some might say I am going out on a limb for saying this but it is one of the most perfect pale ales I have not tried before in a few years. From what I have been told Odd Side is bottling select beers in limited qualities, featuring a different one every couple of months. Last time I was in the store I picked this up at it was the getting down to the last case. Needless to say I picked up the rest that was there and keeping my fingers crossed this will see a regular bottling schedule eventually because I could see it becoming a go to brew for many times to come.